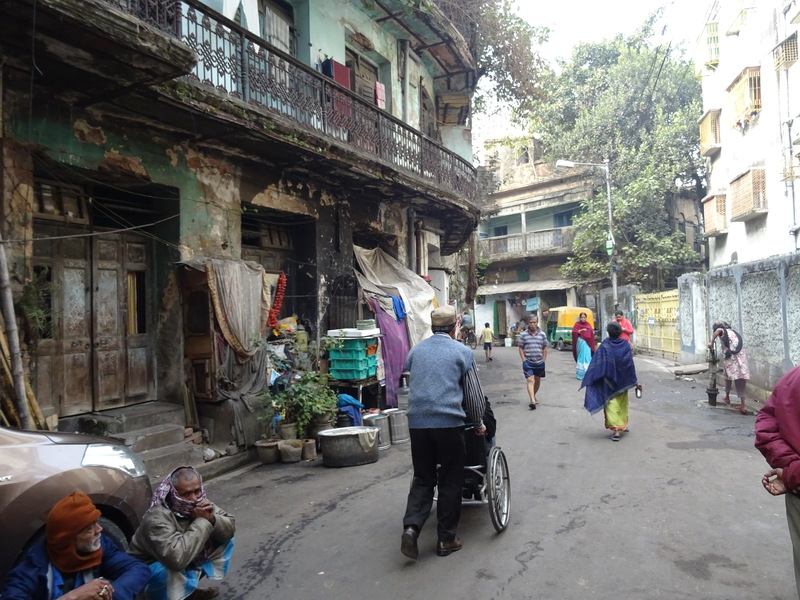 Visiting Kolkata with a wheelchair user is a challenge and certainly not for the faint-hearted. Hand-pulled rickshaws are being phased out, but there is little sign that facilities for wheelchair users are being phased in. I think it would be fair to say that Kolkata is the most inaccessible city for a wheelchair user that we have ever visited. We were there three days and in all that time of being out and about for eight hours each day, I didn’t see one other person in a wheelchair. Given the difficulties of getting about this is not surprising. If you are a wheelchair user, and are thinking of visiting Kolkata, then here are some of the experiences we had that might inform your visit. First, a little background so that you can compare your condition with ours. It is not me, the author of this blog post, who uses the wheelchair, but my husband, so I am writing from the perspective of the carer of a wheelchair user. 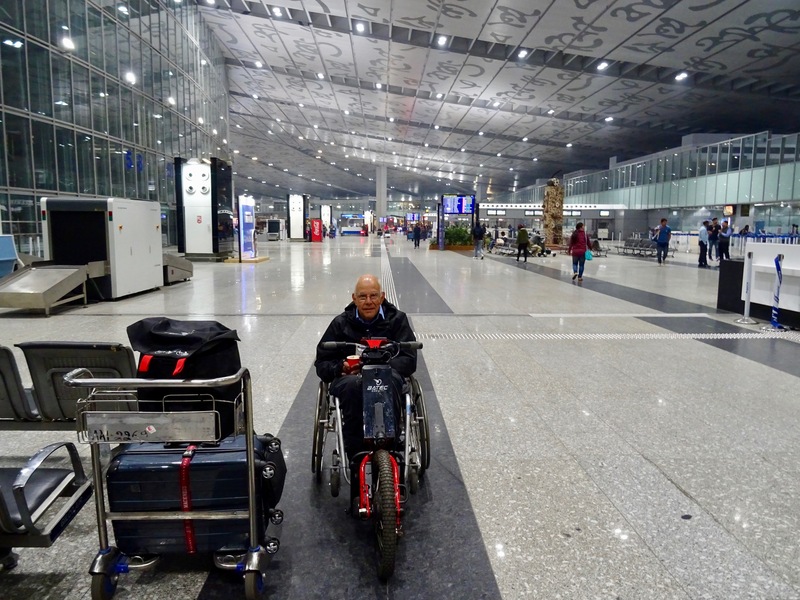 I can’t imagine a wheelchair user travelling to Kolkata without a carer, although I do know that there are some extremely intrepid young wheelchair users who travel the world alone. We are not in that category. My husband is in his 70s, a quadriplegic, partially paralysed from a spinal chord injury. We are fortunate that he can still stand and, with support, bear his own weight, but he cannot walk. So he is permanently in a wheelchair and is not a user who, for example, needs a wheelchair at an airport because of the walking distance required. He simply cannot live or get about at all without a wheelchair. We arrived in Kolkata from Kerala, travelling with Indigo airlines. Some airlines, in this case both Indigo and Etihad in Kolkata, don’t have a lot of experience with wheelchair users (or at least not with wheelchair users who cannot walk and cannot get out of their chair without being lifted). And they have no experience of more active wheelchair users who travel with a bicycle attachment, as we did. Not surprisingly the lithium dry cell battery for this attachment caused great concern, despite the fact that we have a certificate showing that it is safe to travel with. And we also learned that the airport staff, whilst extremely polite and kind, do not know how to lift someone who is paralysed. It is essential to speak up and say exactly how it should be done, or demonstrate, or do it yourself. Everything at the airports therefore takes longer than expected, however much information you have provided before-hand. So be sure to allow time for this. We had, of course, booked our hotel prior to travelling, making specific requests for a disabled friendly building, bedroom and bathroom. We arrived to find that there was a flight of steps into the hotel and a very steep ramp, too steep for me to push even this very light wheelchair user up and scarily steep for going down, but a group of the hotel staff did this very willingly. We also found, on arrival, that we had been allocated a room with the shower over a bath. We asked for a room change and finally were given a room with a walk in shower. However, when it came to it, and after we had unpacked, we found that the door to the bathroom was not wide enough for a wheelchair to pass through. We were told that all the doors in the hotel were the same width. We also met this problem in restaurants, when we asked for access to a bathroom. But it is amazing how with a bit of imagination it is possible to find ways round these sorts of problems and make things work. Sometimes we surprise even ourselves with our ingenuity. For the three days we were in Kolkata, we had booked a car and a guide. The guide was wonderfully informative and the driver turned out to be an absolute gem. The car we used was a Toyota Innova, and the seats were too high for my husband to be able to get in. This meant that the driver and I between us had to lift him in and out several times a day. The guide wasn’t strong enough to do this. I always worry that willing, but inexperienced helpers, are going to end up pulling a muscle or damaging their backs. But the driver and I had this off to a fine art by the end of the three days. You might ask why we didn’t have a smaller car, where the seats would have been lower. The answer is that we needed a car big enough to take our wheelchair which doesn’t fold. A good driver is also essential because of the traffic. Kolkata is so crowded with traffic and people that suitable parking, to enable a wheelchair user to get into and out of the car safely, is very difficult to find. Our driver was a master at making this work, holding up traffic if necessary. Although we were driven around Kolkata, we obviously had to get out to visit the sites. 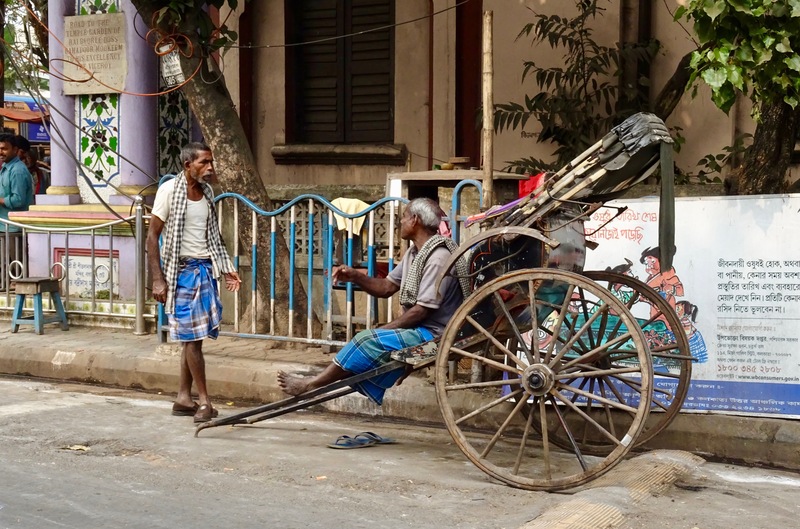 Most places were, in one way or another, inaccessible to a wheelchair user, but, as we have found elsewhere around the world, people are usually very willing to help, and, in a crowded city like Kolkata, it is fairly easy to find four strong people to lift the wheelchair and occupant up (or down) a few steps. Despite this most of the sites were inaccessible for a wheelchair user. There were often too many steps, so we either gave the site a miss, or my ever patient husband waited outside while I had a quick look inside. Leaving a vulnerable person alone on a pavement in a crowded city is not ideal, so I never lingered. These are the sites we visited, or rather, I visited; many of them my husband viewed from the outside. At least it was warm and didn’t rain while we were in Kolkata, so waiting outside was not as uncomfortable as it might have been. Dalhousie Square, now known as Benoy-Badal-Dinesh Bagh (B.B.D. Bagh) Yes No traffic on a Sunday morning so easy to wheel round. St John’s Church Yes Accessible via a ramp. Job Charnock’s Mausoleum Not inside Can only be seen from the outside. Rabindranath Tagore’s house No Flight of steps to enter. No. Flight of steps to enter, but flower sellers can be seen along the pavements outside the market. The Indian Museum Only in part Access difficult and very crowded. Steps into the Bharhut Gallery to see the famous railings, but the public helped to lift. No access to the first floor galleries for us, because our wheelchair was too wide to go down the corridor to the lift. Walk along the Hooghly river starting at the Princep Ghat Monument Yes Good path once over the railway line. Birla Mandir Hindu Temple No Long flight of steps to enter. Jain Temple Access to the grounds only No access to the temple. Flight of steps. The Book Market Yes, but very difficult Pavements very crowded and uneven. Indian Coffee House No Flight of steps. South Park Cemetery Yes Some surfaces were difficult to wheel over. St Paul’s Cathedral Yes Access round the back via a very steep ramp. Ask inside for the back door to be unlocked. Kalighat Temple No Steps to enter. The surrounding area is very crowded. The number of people make it an unpleasant, if interesting, experience for a wheelchair user. Victoria Memorial Yes Loose stones on the walk up to the memorial building makes wheeling very difficult. Entrance is via a ramp round the back, but at the top of the ramp is a flight of steps. Public needed to help lift. Very crowded inside. A site that we didn’t have time to visit, but probably would have been accessible, is the Botanical Gardens. We were sorry to miss them. So not only were many of the sites inaccessible, but the experience of the three days for my husband was of being bundled in and out of a car and up and down steps like a piece of baggage. 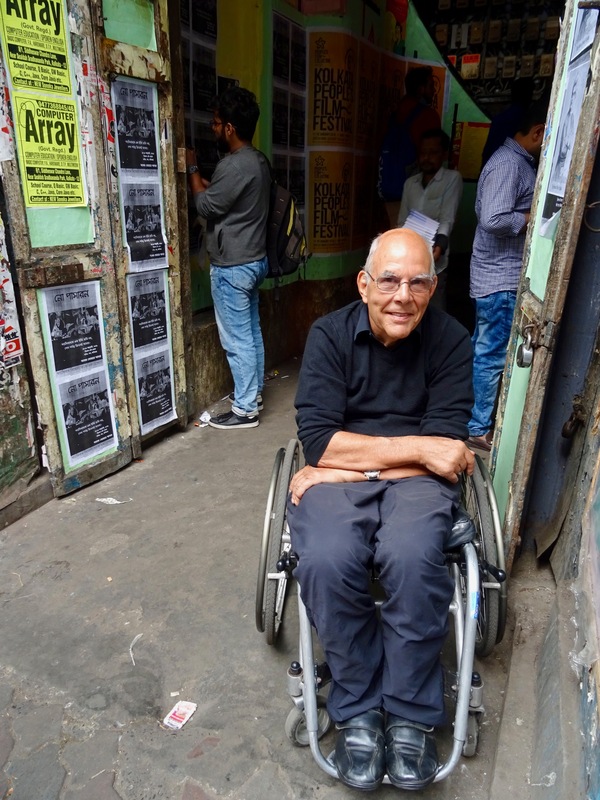 I asked him if, as a wheelchair user, it was worth visiting Kolkata. His response was that most things can be made to work, so it depends on what your motive is. For us the motive was that Kolkata is where I was born and I wanted to see it once more, having not been there for 65 years. We both found that this was motive enough to make the visit interesting and worthwhile, but it will definitely be a one off. Would I, as the carer of a wheelchair user, recommend Kolkata as a place for a person in a wheelchair to visit? The answer to this question would have to be ‘No’. Kolkata simply does not cater for people in wheelchairs and I think it will be a long time before this becomes a priority. It has too many other issues and problems to address. You can afford to stay in the best hotel possible, have a car permanently at your disposal, and have at least two people helping you. You are small and light, and use a small and light wheelchair, ideally a folding wheelchair. The crowds of people, the steps everywhere, and the amount of lifting needed, make this very necessary. You are not afraid to ask people for help. The people of Kolkata give their help very willingly. You are scrupulous about keeping clean, particularly your hands, so wear gloves and use plenty of hand wipes or antiseptic gel. You are careful where you eat. We relied on our guide to choose suitable restaurants and decide on the menu. You have a patient, tolerant disposition and a sense of humour. You have a motive for visiting Kolkata beyond tourism. I have also written posts about visiting Venice and Rome with a wheelchair user. I was born in Calcutta in 1946 and lived there until I was eight years old, when my father decided that we must leave. India was no longer a comfortable place for the British – at least, in hindsight, I think that was what he thought. I was too young at the time to appreciate the problem. Leaving India was no easy decision. My mother cried for months after returning to the UK. My father who had been financial director of a well-known Calcutta firm, Shaw Wallace, had to start again in the UK as a junior accountant, making tea for his seniors. I do not remember a lot about my early childhood in India. I put this down to the trauma that the whole family suffered on our return to the UK. We were all grieving for India, and I, at the age of eight, was packed off to boarding school. I don’t think my mother could have coped any other way. At the beginning of this week, 65 years later, I was in Calcutta again, only this time I was calling it Kolkata. (Many of India’s city names that I grew up with have been changed). I was only there three days, and on this occasion that was just the right amount of time – time enough to see many of the key tourist sites (see my Flickr album), time enough to get a feel for the city of my birth, and time enough to listen for the ‘voices in the ground’. I learned this wonderful and so apt expression, which describes the sense of ‘deja vu’ experienced, or that history is speaking to you, from a blog post recently written by Lisa Lane. It would be fair to say that I was fascinated, excited, stunned and appalled by Kolkata all at the same time and in equal measure. The first thing that hit me was the seeming chaos everywhere (although we didn’t visit new Kolkata, which we were told is calmer, cleaner and quite different to the old Kolkata that we were seeing). 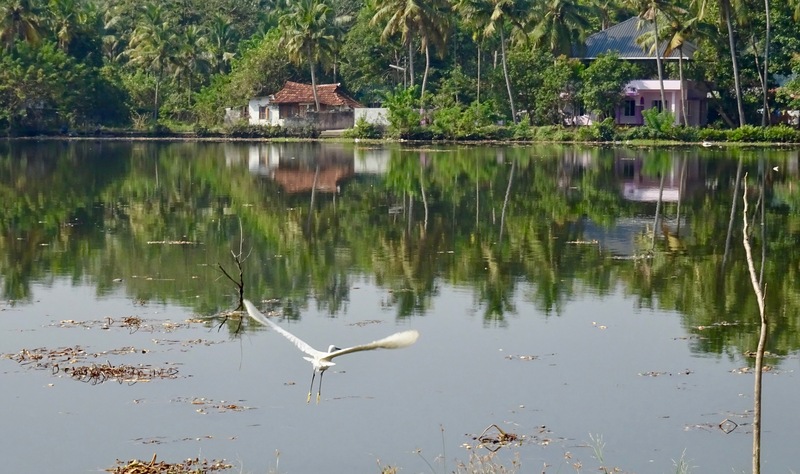 The difference from the tranquil Kerala backwaters we had just left, could not have been more stark. When we asked our travel guide how he copes daily with the chaos, his reply was that since he was born and brought up in Kolkata he is ‘habituated’. The noise is incessant, with constant blaring of vehicle horns, despite the sign ‘No horns’ on taxis. The traffic is nose to tail all the time, with apparently no driving rules. It’s every man for himself. You cannot move for people, not only on the streets, but in all public places. I cannot see how Kolkata will ever surmount the problems which are obviously associated with being over-populated. But most troubling was the dirt. A clean place felt like a sanctum. The shame is that in old Kolkata all the original buildings with their wonderful balconies and shutters still exist, and could look amazing if they were cleaned up. We were told by our excellent guide, Manab, that this won’t happen because the owners have to pay higher taxes if the housing they are living in looks ‘smart’. Evidently these homes which look so grimy on the outside, are quite different on the inside, well maintained and cared for. Manab also told us that the Kolkata we see today is not the same Kolkata that was home to my parents, my brother and myself in the 1930s, 40s and 50s. In those days the population was much smaller and the streets and buildings were cleaner, he said. The problem started with partition and a massive increase in population for which Kolkata was not prepared and is still not prepared; immigrants are still arriving from Bangladesh, to sleep under tarpaulins and use standpipes for washing, along all the streets of old Kolkata. For me, this was a sight that could not be ignored. I wondered if I would become ‘habituated’ to this if I lived in Kolkata. Despite all this, Kolkata is not a miserable place. Incredibly it seems to work, with people going about their daily business seemingly impervious to the chaotic hurly-burly around them. For Manab, an educated, well-read, knowledgeable and travelled man (a retired electrical engineer), Kolkata is truly a ‘City of Joy’. He had read Dominique Lapierre’s book of the same name, which he said he enjoyed, but thought it over-emphasised the problem of poverty in Kolkata. I found it hard to understand this perspective. 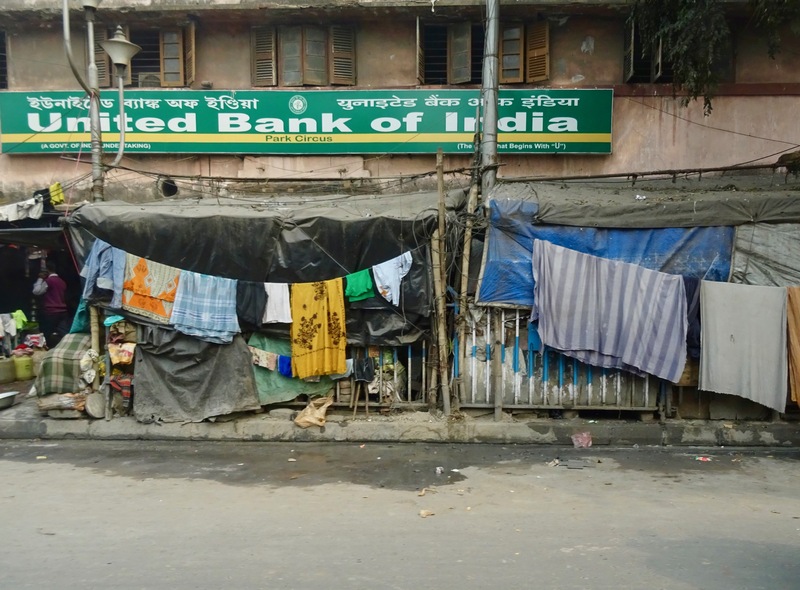 Poverty on the streets of Kolkata seemed to me to be overwhelmingly in your face everywhere. 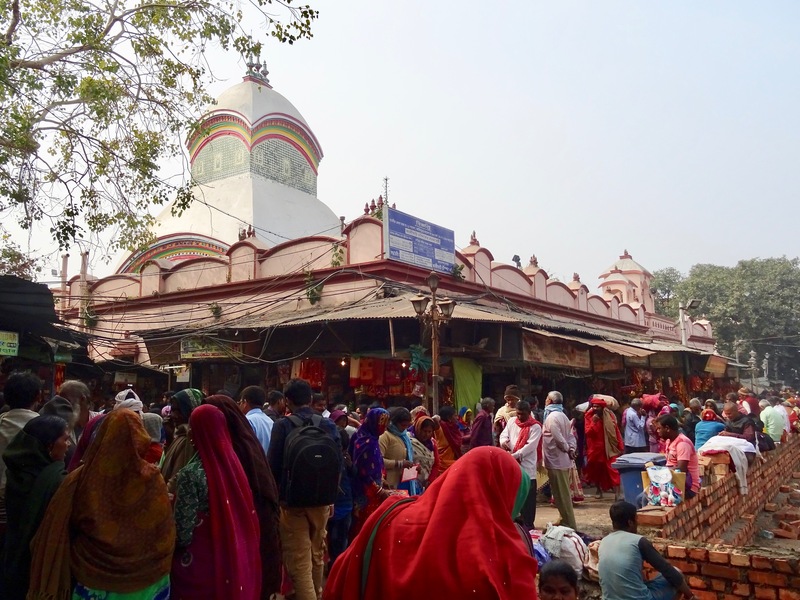 But Manab also said, when we visited the Kalighat Temple to the goddess Kali, ‘All life is here’. With this I could and did agree, and it was this that made Kolkata such a rich and colourful experience. It was so alive – teeming with life. My parents are no longer alive. I wish I had talked to them more about their 15 years in Kolkata. I wonder if they ever visited the Kalighat Temple. I somehow doubt it. I once asked my mother why she didn’t know more about Indian cookery. The answer of course was that she didn’t have to cook. I suspect that my parents, for the most part, lived in a British community bubble. 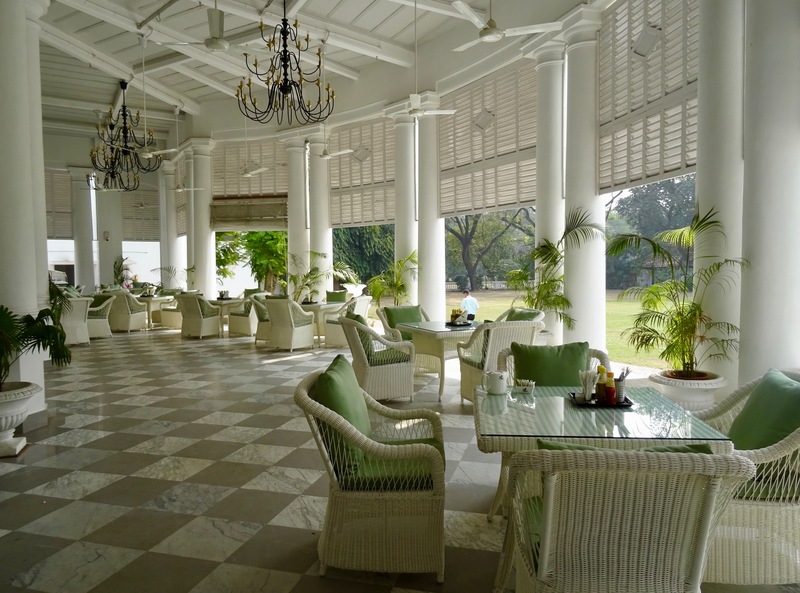 I got an inkling of what that must have been like when we visited the Tollygunge Club, where my parents were members – an oasis of calm compared to the streets we had driven through to reach it. I can remember having weekly riding lessons there at 6.00 am before school, and also spending Christmas Days there. In those days the Club was exclusively British, but Anil Mukerji, the current President of the Club, who kindly gave up an hour of his time to show us round, made it plain that there is no longer a place for anything exclusively British in India. 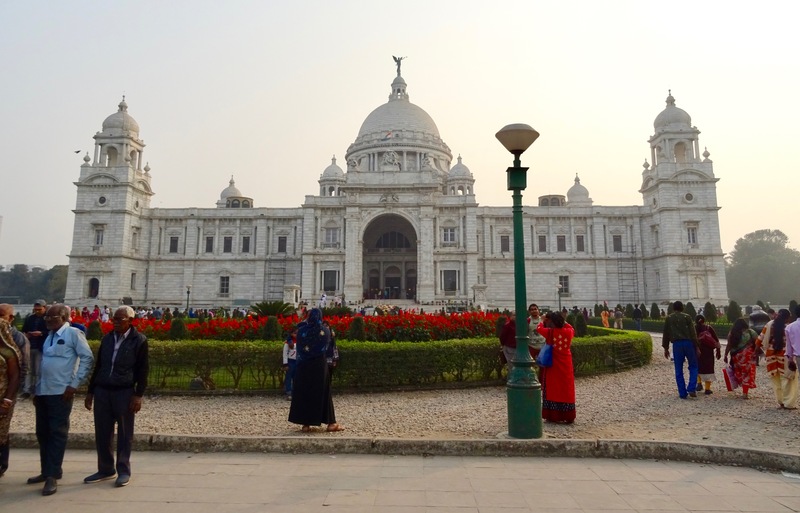 For the most part the impression I got is that the people of Kolkata are immensely proud of their city with its incredible buildings such as the Cathedral and Victoria Memorial, which they fully acknowledge are their inheritance from the time of British rule. As Anil Mukerji said, good and bad has been done on both sides and now the UK and India are friends. Whether or not this is true, it is the people of India that stand out for me. They are so wonderfully generous of spirit, so wonderfully tolerant, patient and kind. So did I hear ‘the voices in the ground’ in Kolkata? I certainly walked a small way in the footsteps of my parents, even finding the address on my birth certificate, 10 Palace Court, Kyd Street, where I must have lived on first entering this world. I felt excited and happy to be in Kolkata again after so many years. Despite not recognising a single thing, it felt familiar.